Perhaps the most popular or well known of butterflies is the Monarch (Danaus plexippus). Here at Lake Monticello we get to see these beautiful creatures arrive in September as they migrate south to Mexico to winter over. 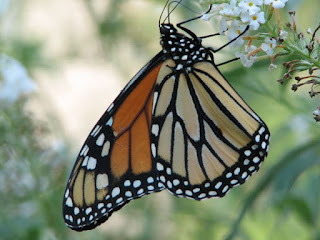 Their incredible migration is what has made the Monarch so well known. Monarchs west of the Rocky Mountains travel to small groves of trees along the California coast. Those east of the Rocky Mountains fly south to forests high in the mountains of Mexico. 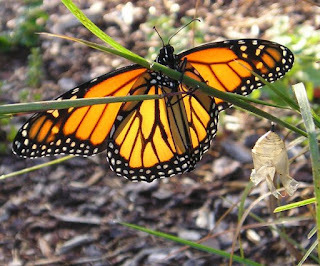 In all the world, no butterflies migrate as far as the Monarchs of North America. They travel up to 3,000 miles and are the only butterflies to make such a long, two-way migration every year. Amazingly, they fly in masses to the same Winter roosts, often to the exact same trees. Their migration is similar to some birds or whales; however, unlike birds and whales, individual Monarchs only make the round-trip once. It is the fact that their children's grandchildren are the ones that return south the following Fall that fascinates the mind. As the days grow longer, they begin to mate and they leave their Mexican roosts during the second week of March, flying north and east looking for milkweed plants on which to lay their eggs. These are the only Monarchs left that can produce a new generation. If they return too early, before the milkweed is up in the Spring, they will not be able to lay their eggs and continue the cycle. The migrating females each lay hundreds of eggs on the milkweed plants they find in the southern United States before they die. The eggs hatch about four days after being laid and the first Spring caterpillars hatch, consume the milkweed plant which is the ONLY plant that Monarch larvae will eat. Within 30 days of the eggs being laid, you will have an adult butterfly emerge from the chrysalis as is shown on the photo here one taken one morning on my way to the mailbox. Butterflies are not like humans, who grow in size as they mature into adults. When an adult monarch butterfly emerges from the chrysalis, it emerges at its full size and its wings do not grow larger. While there is some variation in the sizes of adult monarchs, they measure around 4 inches wide with wings open. It is these newly emerged Monarchs that recolonize their parents' original homes. Summer Monarchs live a much briefer life than the overwintering generation. Their life span as a butterfly is only three to five weeks compared to eight or nine months for the overwintering adults. The summer produces three or four generations of Monarchs, depending on the length of the growing season, until once again there are millions of Monarchs all over the U.S. and southern Canada. 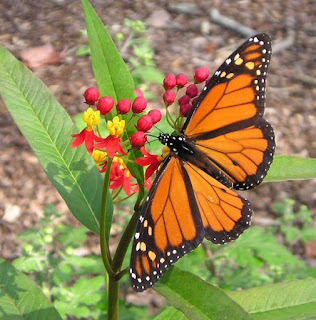 If you'd like to help the Monarchs survive, planting various species of Milkweed (such as Butterfly Weed) would be very beneficial as hosts for the eggs/larvae and also for nectar for the adults. 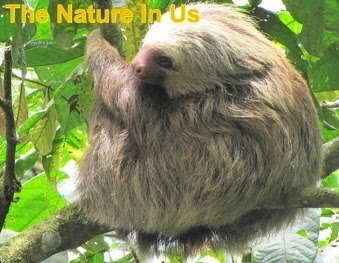 Other favored nectar sources are verbena, zinnia, purple coneflower, buddleia, and Mexican sunflower. You can get involved in many Monarch projects shown on the MonarchWatch.org website. We participate in the Monarch Waystation Program by providing habitat that includes plant sources for all stages of the Monarch's life.